The end of a relationship can be extremely distressing. But even though divorce or separation may have become inevitable, it is still possible to manage the legal split in a dignified way – and this is all the more preferable when children are involved. At Charles Hoile, we know that a willingness to compromise is beneficial to achieving a civilised conclusion to a marriage or partnership. With this in mind, we remain sensitive and sympathetic to the needs of our clients and are always focussed on achieving an end result that is acceptable to all. Recommendations for the division of property and wealth, and access rights to children, are made with fairness very much in mind. We are able to deal with domestic violence cases, including emergency court applications for the appropriate protection of clients and their assets. The company also has a franchise for legal aid work (www.gov.uk/legal-aid) and eligibility is assessed at the first meeting. Charles Hoile Solicitors are members of Resolution, (www.resolution.org.uk), an association commited to promoting a constructive, non-confrontational approach to resolving family disputes. 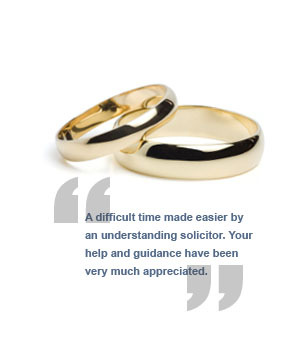 Where possible, our solicitors look to resolve all aspects of a divorce or separation through calm, considered negotiation, thereby avoiding the need to go to court. However, when court proceedings become necessary, we employ a vigorous and robust stance in the best interests of our clients. Getting divorced is a stressful time, both emotionally and financially. Charles Hoile offers fixed fees for divorce and related financial and children matters. These will be calculated up front to ensure clients receive a professional service at a reasonable cost, without any hidden surprises. Ultimately, what most separating couples wish for is a truly amicable split. At Charles Hoile, our aim is to help clients achieve just that.